My Places of Green is a further exploration of the 2010 solo exhibition Into the Green at Sabbia Gallery from one of Australia’s most prominent glass artists Emma Varga. 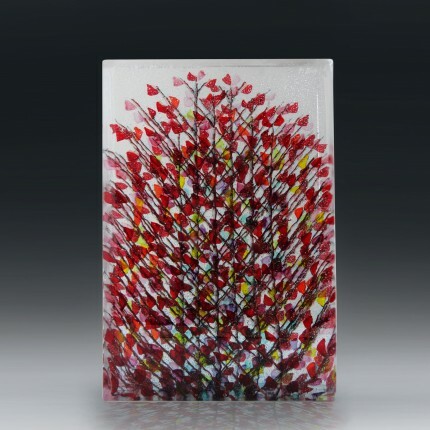 Into the Green was a result of the artist’s all consuming passion for the medium of glass and further reinforced by her many travels. Emma has an enduring focus on the small details of colour, pattern and repetition that she continues to use in her work and has noted through photography along the way. My Places of Green continues to tell Emma’s story, giving us a greater insight into the places that mean the most to this artist. These places are real to Emma and always at the forefront when designing and creating her beautiful, vibrant and intricately detailed works. Emma constantly speaks about ‘The Green’ that continues to inspire her. This green can be found in the corner of a park, a backyard, a vine climbing onto a secluded wall, or some resistant little bush emerging from the gaps between lifeless concrete walls. These are often the small flora that we do not notice, but they are there to make our busy lives more beautiful. My Places of Green, as in her 2010 exhibition, presents the flora as an abstract, reflecting the sense of the place and emotions triggered by the colour and finer detail. This flora is derived from thousands of photos taken by the artist at places where she has spent some time, such as Ada, her place of birth in the former Yugoslavia, Collaroy and Dee Why where she has lived for the last nineteen years and Ushuaia Argentina where she continues to fall in love with the landscape. Profile: Nilima Sheikh, "Each Night Put Kashmir in Your Dreams"